There are hundreds of general golf backswing tips available on the internet. They promise 300 yard drives and the ability to never hit another slice ever again. How do you sift through all of them and determine which ones are useful? That's a very hard question! On these pages I will not be making any promises that you are going to drop your handicap by 10, or that you hit a perfect shot every time. That isn't realistic! My intention is to provide you with the basic mechanics of a proper golf swing and then you can modify as needed because every golfer is going to be different. Jim Furyk has an unorthodox golf swing but he is considered one of the top golfers in the world. So now that you have a good grip and stance, its time to begin the swing. The main thing to remember is that the club needs to impact the ball in the same position it started in. A lot can go wrong during the golf backswing and downswing! A great piece of advice is just to keep it simple! Don't over think the process. Every golf swing will be different and you simply need to find something that works for you. This is where the mental aspect of golf comes in. I know that when I try to analyze every little thing about my swing, I typically end up hitting a poor shot. If I just step up the the tee, take a few gentle swings, and let it rip, things usually work out. Start your back swing relaxed and at a comfortable pace, initially keeping your lead arm straight. You back elbow will stay close to your side and will hinge naturally as the club raises. You will see some people taking the club back extremely slowly during the initial phase of the back swing, but I don't think it needs to be taken to that extreme. Moving too slowly during the back swing may lead you to over swing during the down swing. That is why I think a nice, comfortable pace is the way to go. I think a great tip for keeping your right (right handed swing) elbow tucked in through the backswing is to take a folded towel and place it between your side and upper arm. Perform practice swings with the towel in this position, trying not to let the towel fall out. This also could be used as a diagnostic tool to see if you right elbow is moving too far away from your body. In order to keep your lead elbow straight, you will need to incorporate both trunk and shoulder rotation. The more flex that you have in your lead elbow, the less accurate your shot will be. You essentially want your shoulders, arms, and trunk moving at the same time. A common tip that I have seen many places for the golf backswing is the position of the back hand (right hand for a right handed golf swing) at the top of the swing. Imagine a waiter holding a tray by his shoulder with his right hand. At the top of the backswing, your right hand should be in a very similar position. The main goal of your entire golf swing is have it committed to muscle memory in your brain. That way, without even having to think about it, you automatically perform a great swing, which leads to better results! -If you are having trouble with the full swing, shorten it! You may not develop as much power but you will likely be more accurate. 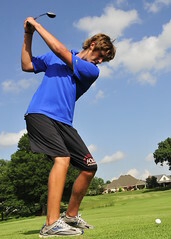 -Your lower body should be relatively still during the golf backswing. There will be a slight weight shift to your back leg, but the position of the knees and hips shouldn't change drastically.